Today is the 34th anniversary of the arrival of craft brew making to the United States. My father, Jack, wanted to bring the taste of the beers he had sampled (okay, more than “sampled” ) when he was in the Navy, to his homeland. And he did it by pure ingenuity, sweat and imagination. 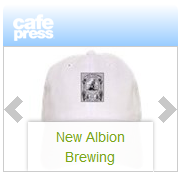 It was 34 years ago today the New Albion Brewing Company was born. 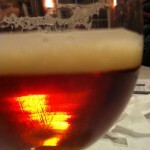 Here’s an excellent blog post about it from Jay Brooks in his Brookston Beer Bulletin: http://brookstonbeerbulletin.com/beer-birthday-craft-beer/ . Thank you Jay, for noting that, and for your effort to have Jack’s accomplishment recognized by the state of California. Disclaimer: I didn’t grow up with Jack. I’ve only known him for the past 10 years or so (something I’ll post about another day). I wish I could say I had been there in 1976 when all that was going on–I was only 12 years old at the time anyway, so I don’t know how much I would have appreciated it then. But I do appreciate it now. 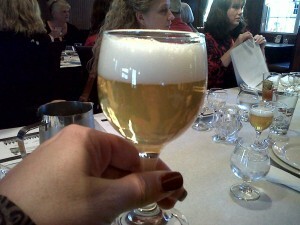 Tonight my husband Paul and I celebrated the anniversary by attending a beer dinner sponsored by Sierra Nevada. It was held at a local restaurant called the Glenwillow Grill, and for only $25 each, we were treated to 5 courses of beer and food, plus a bonus tasting. Our first course was calamari prepared with brown sugar, orange marmalade and I don’t know what else–but it was delicious, served with the Kellerweis Hefeweizen. It was a light and tasty start to the meal, getting our appetites primed for what was to come. Next came the standard Sierra Nevada Pale Ale–perfectly accompanied by a spicy chicken, rice and red bean dish. Nice combo of the bite with the smooth. Up next was one of my fall favorites, the Tumbler Ale, served with a delicious pulled barbequed beef, dressed up as a po’ boy with the house cole slaw. Delicious pairing, and probably my favorite savory dish of the night. The heartiest fare came next: a slice of prime rib in a thickened au jus, served with a dollop of horseradish cream sauce, and the Sierra Nevada Torpedo Extra IPA. This was my husband’s favorite dish, and I heard several other of the men at the table moaning over this one. I think that one put me over the top–I was getting quite full. Fortunately, dessert was next, and everyone raved about this surprising pair: the Stout–served with a hand-churned vanilla bean ice cream and drizzle of chocolate sauce, topped with a strawberry. We were instructed to pour the Stout right over the ice cream–making the most delicious float I’ve ever had. Seriously. The bonus round came next. 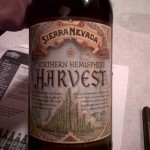 Our Sierra Nevada rep hosting the meal, Sean, announced that a shipment of the Harvest Series Northern Hemisphere had just arrived at the warehouse the night before. We would be the first in the region to taste this wet hop ale–a perfect end to the meal! Sean also told us that outside of Chico, California, where the Sierra Nevada Brewery resides, no city drinks more of their beer than Cleveland, Ohio! Yeah, Cleveland, you ROCK! So finally, just before we took our leave, Sean noted that our group wouldn’t be gathered celebrating these fine craft brews if it hadn’t been for my father, Jack McAuliffe. Everyone raised their glasses in a toast. It made for a most auspicious occasion, and it’s something I’ll share with Jack when we talk tomorrow. I know he’ll be appreciative of the thanks. Next post: She did it!